Receding hairline? With rumours surrounding footballers like David Beckham and David Silva having a hairline hair transplant, the procedure is becoming popular (1,2). Planning your hair transplant is a tricky process. You need to think carefully about how you will continue to bald in the future so any new hairline doesn’t look unnatural. In this blog we take you through what you need to think about when planning a hairline hair transplant. Where is your hairline at the moment? How much hair do you have that you can transplant? How old are you and will your hairline recede further? Will you be able to prevent any further hairline recession? In most types of hairline recession, the main cause is male pattern baldness (3). This process is caused by DHT (dihydrotestosterone) which causes the hair follicles to become weak and fall out. It is called a “pattern baldness” as the same pattern of hair thinning and balding appears in most men affected. The different types of pattern depend on how severely you have been affected by hair loss. They are summarised in the Norwood Scale as you can see in the picture below. By looking at the Norwood Scale you will be able to classify where your hairline is at the moment. If you hairline is at Norwood 2/3 then you should be able to bring your hairline forward to restore it your preferred position. If you are at stage 4a/5/5a/6 you need to think about how much hair you can use to create a hairline that you are happy with. You might better off with a hair transplant that gives you hair you can style over areas of balding. Your plan should be to restore your hairline to a position of Norwood 2 or 3. The amount of hair you have left at the back of your head is crucial. If you have dense hair at the back then it is likely you will have enough hair to achieve a hairline you would like. 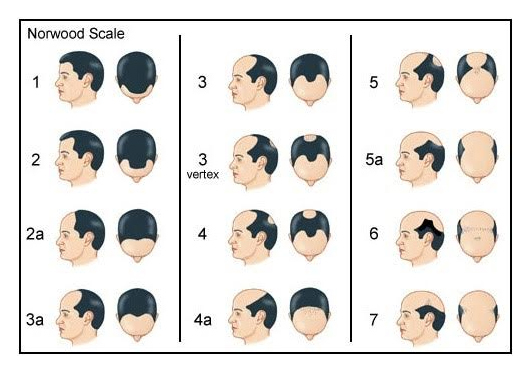 For those who don’t have enough hair then carefully plan how you can achieve a hairline you want- especially if you are Norwood Scale 4a/5/5a/6. If you don’t have much hair you may decide to have a hair transplant that gives you coverage of hair. This allows you to style your hair the way you want over areas of hair recession. If you are young (<26 years old) then you might want to wait until you’re 26 years old. This means your surgeon can assess the full pattern of your hair loss. It is important to know how you have receded so far, so your hair transplant surgeon can plan future hair loss and plan a hairline that would suit you as you age. It is likely that everyone will recede further, so you need to make sure you plan for future hair transplants or stabilise you hair loss with medications like Finasteride. Taking Finasteride is an important decision and as with all medications there are side effects. However, particularly if you are planning to have children, taking finasteride can be tricky. You will need to plan when to stop taking finasteride (when you are trying to conceive) and when to restart (when your partner stops breast feeding). Planning this in advance with your hair transplant surgeon is important- make sure you discuss this with them! Whether or not you are taking finasteride, planning a hair transplant around your family plans is certainly achievable. So what hairline should I go for? Seeing a hair transplant surgeon is the first step to answering this question. At The Treatment Rooms London our surgeons make sure to take you through all the considerations you need to make before deciding on a hair transplant. We prefer to plan a hairline that is mature which will suit you for the rest of your life. A lot of patients request for their hairline to be brought down to match the hairline they had when they were in their teens. It is our opinion that this is not a good idea. Not only will this require many hair grafts that thin your donor zone but also your ongoing balding process will mean a hairline that is too low will look odd. As you age, your temples will recede and a hairline that is low will look like a strip of hair separated from the hair behind it. It will look unnatural and it won’t suit you in your middle- late age. Bringing your hairline too low won’t suit you as your recede in your temples. Choose a mature hairline that will look good for the rest of your life. It also helps to save more hair in your donor area if you choose to have a second procedure down the line. Our advice is to plan for a mature hairline. Going for a mature hairline will mean your hair grafts can be used for dense, natural results without thinning your donor zone. The hairline will also be fashionable throughout the rest of your life. Another benefit from choosing a mature hairline is that you have saved more grafts at the back of your head incase you need a second hair transplant.